SAME Cafe Offers Organic Meals. Those who can pay, do. Those who cannot help. Totally Different! In a touching moment celebrating the possibility of real community, SAME Café, a non-profit restaurant in Denver, Colorado which operates on a pay-what-you-can basis just celebrated its tenth anniversary, in spite of all the naysayers who said it could never work. 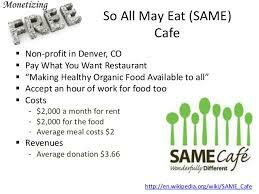 SAME Café, short for “So All May Eat” opened in 2006 on Denver’s notoriously rough and tumble East Colfax Boulevard, and has served many thousands of patrons, not all of whom were able to pay for their meals–at least not in cash. But the restaurant staff wasn’t dealing with the usual “dine and dash” suspects, chasing people down in the dirty snow that lines the gritty street and attempting to extract payment under threat of calling the cops. It seems an unlikely business model, more a post-Woodstock fever dream born of a revelation embedded in the brown acid than a sustainable model for the 21st century. But working with organic, locally sourced food producers, and a mindset that involves celebrating the dignity and life of all people, rich and poor, the founders of SAME have created something beautiful that could be seen as a roadmap to a future very different from the cold calculus of profit we live under now. Another wonderful and unique adaptation of the restaurant is they have no set menu. Each day’s meals are created on the spot using whatever fresh organic ingredients are available that day. No Sysco truck pulling up outside offloading slabs of flavorless breaded frozen chicken. No Styrofoam flavored bread slathered with congealed grease from a five-gallon jar labeled “mayonnaise.” Just a bunch of good people helping out other good people, enjoying a meal together in exchange for whatever they can spare, or a little bit of their time. Sounds like those kids who are into this whole socialism thing might be on to something.